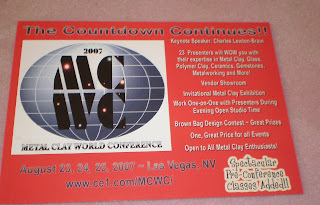 The Metal Clay Conference will be held in the South Point Hotel on Aug. 23, 24 & 25. The 3 day conference will be full of information, guest speakers and demonstrations. The cost for the actual conference is $300.00. The public is invited to shop the vendors for free on the following days and times.